Likely being put on thier own to prevent issues on interlined routes. Also makes me wonder if this is also in preparation for the 301 and 340 leaving STC. 301 we know is likely to be at RTC in September and the 340 has been rumored to HTC for quite some time. 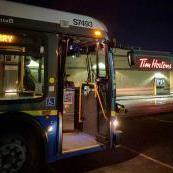 In emergency situations such as this event, sometimes emergency personnel will ask Translink for some of thier buses to be used for people affected by said event for a place to sit and relax or simply for a central place for paramedics to tend to people with minor injuries. Spoke to the op of 8140, my relief earlier in the day and he said no one used his bus at all likely because it was a nice sunny day. They also used a few buses for shelter just in case. 8140 is the only one I know of, came off the 43. Maybe for right now the 404 should terminate at Ironwood, but once the 418 goes to riverport it may be a useful connection. I known the 403 will be there, but who knows. Could take some pressure off the 410 and the 418 will likely be quicker. Since this is a dream thread, maybe even have a route from riverport to Ladner exch if it might be needed. As per the board meeting minutes, the XN40's are delayed to prioritize delivery of the XDE60's which was Translink's request. I believe they are still coming just not as soon as originally planned. I think it was mentioned in one of the board meetings last year that they are already looking into a complete farebox replacement. This would be the more likely option with maybe two additional buses to be on the safe side. Most layovers during the rush is between 4-10 minutes with a bit more for the PM rush probably because they have more on the run than in the AM. I can confirm, but I won't go into detail. XN60 won't happen as far as I know, not powerful enough for our needs from what I've heard. When the artic order was announced last year, it was noted that they were going to have a few XD60's including one with a newer engine than what the others would have come with. Considering that was decided to be a test of the new engine and they converted the entire order to XDE60, I doubt they will be going with XD60's either at this point. While the XD60's are cheaper, I believe they get some sort of climate credit for ordering the XDE's and the new BAE's fit into their plan of having a more fully electric fleet in the future if the decide to go that path. it's not unusual for buses to be "out of place" on maintenance runs requiring lots of KM's or just simply a long drive to diagnose and/or make sure a repair is effective. I've seen VTC nova's on Hwy 99 heading towards White Rock before being driven by maintenance personnel and they've usually got the laptop with them monitoring things. Apparently the driver of the Mustang had a medical emergency and that's what caused the accident. That's all news 1130 said earlier today. Heard this from an op today who heard it from a mechanic at BTC so grain of salt. Some of the transfers going on right now are temporary until September. For the September sheet, some of the 18000's will be sent to where they need to be for new B-Line's and BTC will get back some of what they've sent out. This does explain the random DE's being sent to PTC, but I do believe the D60LFR's will stay at PTC. Assuming the 41st B-Line will be operated out of HTC (not confirmed yet, but likely to happen), the 43 will remain at BTC until the end of the summer sheet. 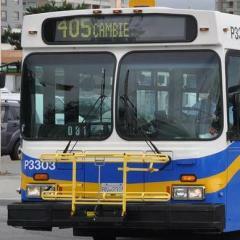 Maintenance will be able to take care of bus transfers over the labour day long weekend. As for why it seems to take a long time for things to get implemented is simply because it takes allot of time and work to get things going. To give some insight into timing, the September sheet is already being worked on and getting ready for final review and approval by the end of April. A sheet is usually finalized about four months before it actually goes into effect. Rarely can they add or change anything after the final approval time. They are repaving the entire loop over the next few weeks. I think your on to something here. They don't typically put a bus out for service until it's completely ready in all aspects unless there is a reason for it. 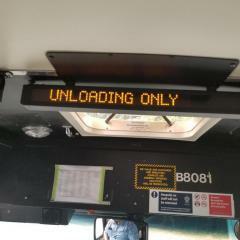 I'm going to guess your on the right track of them installing what CMBC has on thier buses. 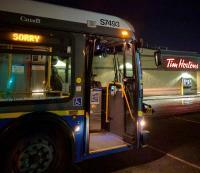 Translink is on a mission to improve customer image all over the system and this could be a part of it.